Fine art, Illustration, graphic design and the art philanthropy of Sam Morrison: Explosive New Paintings! Over the weekend I was invited to a party/bonfire. Since the food and beverages were being provided by the hosts I wasn’t sure what to bring. After giving it some thought I decided to bring something to get the fire going. Gasoline cans and oxygen tanks quickly came to mind. Then I remembered there’d be kids at the party. Totally unsafe. 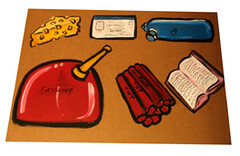 So giving the idea more thought I decided to draw and paint various highly flammable objects on a sheet of cardboard. From there I would cut out the cardboard objects and mount them to some wood stakes. Which of course would be stuck into the ground of the fire pit. As you’ll notice from the photo above I painted the gasoline can, an oxygen tank, a book (I liked the idea of having a book burning), a bundle of dynamite, a drivers license photo and a piece of cheese. (Admittedly, I don’t know why I chose a piece of cheese, it just seemed to round out my theme). Anyway I cut out the objects/mounted them to stakes and took them to the party. Fortunately or unfortunately my highly flammable objects never made their way to the fire pit (or I would have shown pictures.) Instead they were either admired by people who have an appreciation for ironic humor or they were looked upon by others who wished I’d brought an extra bag of Doritos instead.